Wood is that element that works wonders in terms of designing an interior. A rustic look that adds to the elegance of beautiful homes and bespoke offices. 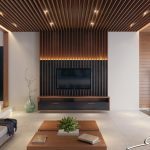 Be it a panelled wall, floor or ceiling, wooden interior is the classic style that enhances the contemporary and gives the modern a seasoned touch. Wood work can now be integrated with your concrete structural designs or architectural designs. Wood houses or wood cabins, portable as well as stationary have been in use for a very long time. Nowadays, wood laminates or engineered wood is used which is easy to maintain and durable too. Wood work interiors do not end with just the outer shell structure or the inlay. Adding stain to wood makes it look more appealing as it brings the grain and the colour of the wood to the fore, thus enabling you to blend it with the other accessories in the room. Also, wood paint of your choice can be used to match with the ensemble. For durability and a soft sheen, eggshell paint can be used on your wooden balustrades and other panels. Wooden design on walls or ceilings can be carved or embossed and can be embellished with ornamental designs too. A wide palette is available with our designers that you can pick to suit your budget as well as style. Give your study at home or office parlour an elegant warm persona that makes the aristocrat in you stand tall among peers. A dark chocolate mahogany wood will add that timeless warmth inside, while for a simple modern look a reddish brown would make it authentic. For those fresh airy rooms a creamy textured appearance will elevate the standard of your prized possession – your home or your workspace. Digg Interiors with their expertise in wood know-how will guide you through the types of wood – polishing, painting that can be used for your home interiors and advise you on maintaining your wood interiors for a long time. 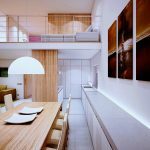 Wood interior designs include wooden door design, wooden bed design, wooden wardrobes and all other wood work or furniture used in homes. Wood designs can give your office the modern day-to- day casual look or give your home the period look of a bygone era. From traditional sophistication to contemporary ease, wooden interiors weave a charm of its own. Digg Interiors - The Interior Designer Professional With A Difference. We bring your homes to life and make your businesses more vibrant and productive. Come feel the vibe as we take you to your favourite spot in your home or the busiest corner of your workplace.